That’s right. Never again will you have to deal with curtains that are the wrong length, or toss pillows in a print that are “good enough.” Nope. 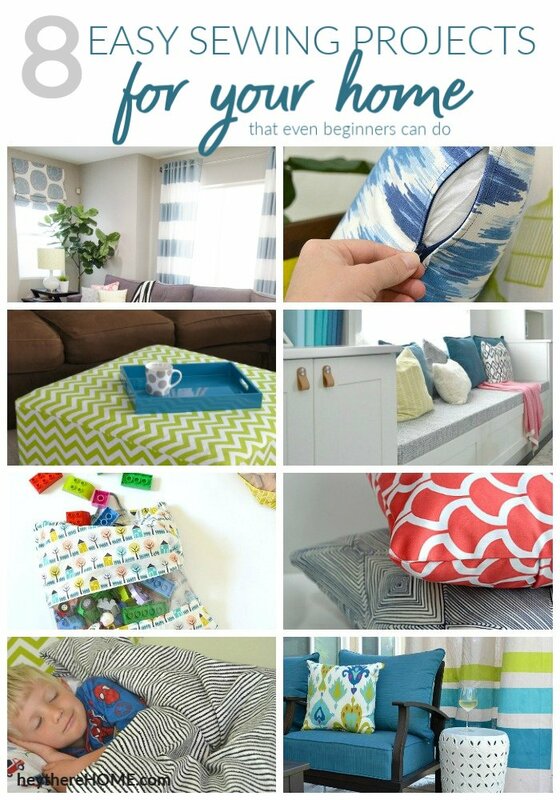 There are so many amazing fabrics out there just waiting for you to make something for your home, so I rounded up my best sewing projects for beginners, in hopes that you take one on and create something new and fresh for your own home. All of the projects you see below are perfect beginner sewing projects only require you to sew a straight line. I basically taught myself how to sew, so I don’t get too technical or fancy with my sewing terms or my projects. If I can learn to sew and make these, you can too! If you’re new to sewing, definitely start with a fabric that isn’t too thick. It will make your job easier. Something like a light weight home decor fabric will be perfect. Just avoid any fabric with texture. Be sure to set up your sewing area properly. Using a clear table is a must. I can’t tell you how many times I’ve tried to sew something on a small spot on my table. It’s frustrating and doesn’t make it very fun. So do yourself a favor, clear a table and have all your supplies within reach. I also like to have a good amount of space on the floor right next to my sewing table. This makes it easy to move your project to the floor and use your cutting mat down there since when you’re sewing home decor, you’re often dealing with a lot of large pieces of fabric. There will be times you need to have everything laid out smooth for pinning and things and having a big floor space is key. When it comes to beginner sewing projects, it doesn’t get easier than this because once you have your fabric cut out (which will probably be the hardest part, you are simply sewing two pieces of fabric together. I love making new pillow covers for worn out toss pillows. It’s a great way to refresh the toss pillows you already have without having to go out and buy new ones. 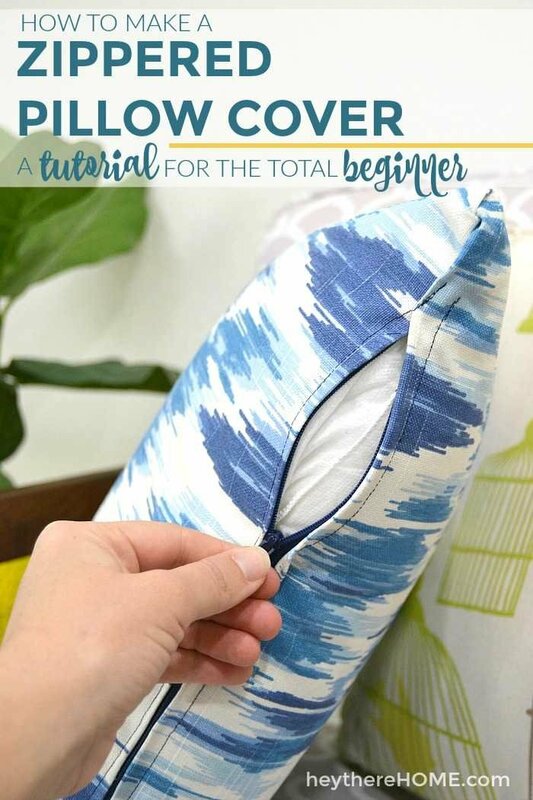 Get the step-by-step tutorial for how to sew an envelope pillow cover here. To save money, I use a flat sheet for the back side of the duvet cover and I even have a way to keep the duvet insert in place. 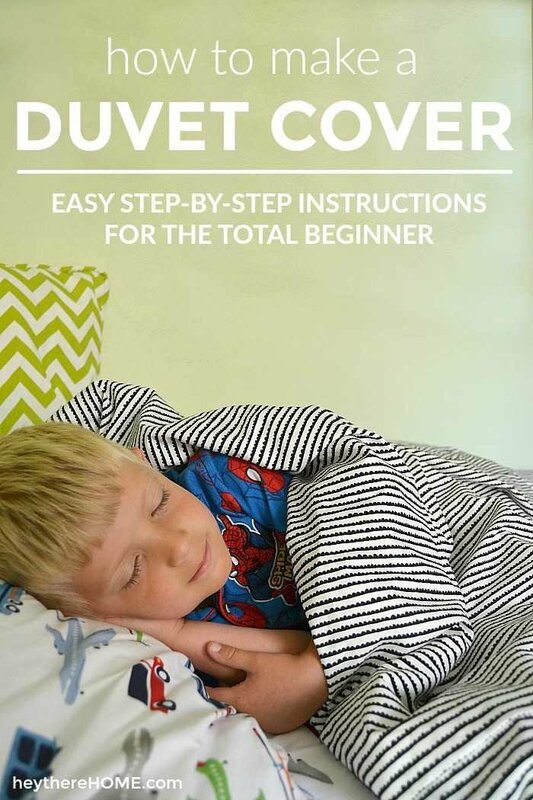 Get the easy steps for how to make a twin duvet cover here. 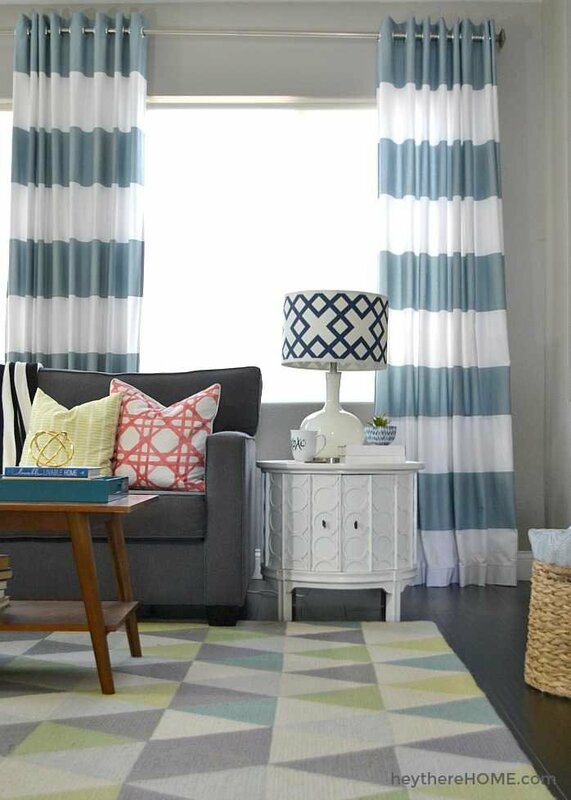 This project was one of those that began with spotting a shower curtain I loved and immediately knowing that I wanted to make curtains for my family room with the same bold stripe. But I couldn’t find a fabric similar at a decent price so I bought a few of the shower curtains and turned them into DIY grommet top curtains! Learn how to make grommet top curtains here. This is one of my favorite projects to date because of the BIG impact they have on the look and fee of our outdoor living room. And did you know this project landed me in the pages of Better Homes And Gardens Magazine? Crazy. Anyway, I simply took measurements of how high I wanted my outdoor curtains to be, found drop cloths that were at least a little longer than the required length, an sewed some hems (including one to put weights in so the wind doesn’t blow them all over the place.) Then I spray painted bold stripes on them. Who even knew you could spray paint fabric? See exactly how I made my DIY outdoor curtains in this post. You can also see how to make an outdoor curtain rod for cheap here. Have you ever priced out a custom upholstery job? It can be crazy expensive and sometimes totally necessary, like when I had the chairs in my front room reupholstered in a beautiful blue velvet. That was far beyond my skill level. But even simple jobs can be expensive so when I can DIY a project, I do and I save a lot of money. That’s exactly what I did when I finished our built-ins with a bench seat. The bench seat (obviously) needed a cushion so I made one myself with foam I found on Amazon and a beautiful fabric that ties everything in the room together perfectly. 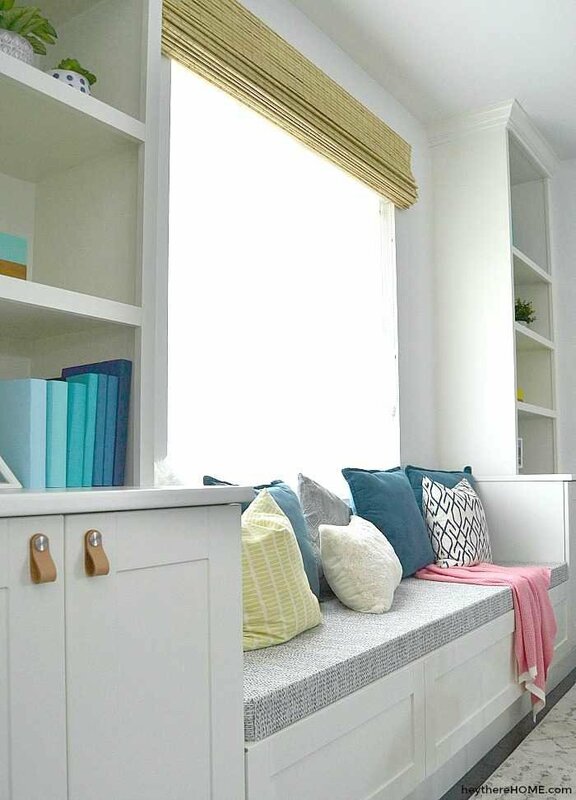 See the steps for how to make a bench seat cushion here. I discovered a really easy way to install a zipper when making a pillow cover and it really just involves stopping your sewing machine, pulling the zipper past, and continuing on. See the steps for how to make a pillow cover with a zipper here. This project tutorial pretty much confesses that I’m one of those people who grab free furniture, that someone’s getting rid of, off the curb on occasion. But I’m not sorry I did in this case! This ottoman is still alive an kicking in our loft and since it’s the main area my kids play, and jump, and act crazy, it’s seen a ton of action. The best part is that I figured out a way to have the slip cover attach underneath with hook & loop so it looks sleek, but it’s easy to remove for the occasional washing. See how I transformed an old ottoman into a super kid friendly one with a DIY Removable Slip Cover here. 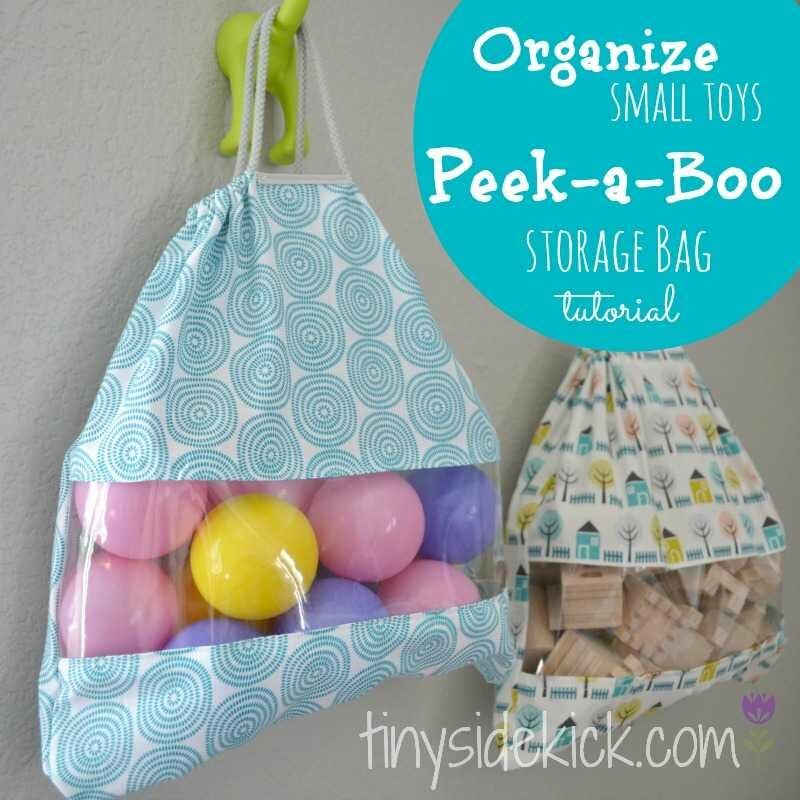 Get the tutorial for these DIY Peek-A-Boo Toy Storage Bags here. I can’t wait to see what you create for your home! Definitely shoot me an email when you finish one of these projects. I want to see what you create! The projects list came on the right day! We have snow and ice !!!!! Now to get that sewing machine dusted off!